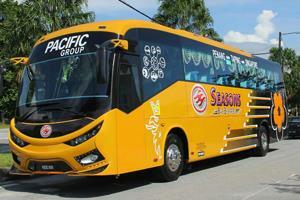 Seasons Express is one of the largest bus operators based in Penang. 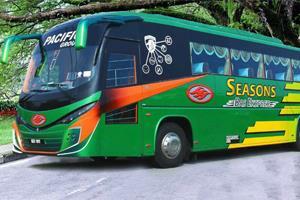 Seasons Express provides comprehensive bus service departing from Penang to various destinations in Malaysia. Seasons Express provides the most daily departures from Penang Sungai Nibong Termianl to Kuala Lumpur, alighting at Duta Terminal and Terminal Bersepadu Selatan (TBS). Apart from that, Seasons Express provides 2 to 3 daily departures from Penang Sungai Nibong Termianl to cities like Kuala Lumpur alighting at One Utama and KL Sentral, Shah Alam, Klang, Seremban, Malacca, and Johor Bahru. The departure location and check in location is conveniently located at Sungai Nibong Bus Temrinal, which is just 15 km south from city centre Georgetown. Local bus 401 is available at high frequency to connect Georgetown and Sungai Nibong bus terminal. Seasons Express buses are famous with its on time departure and direct route service. For example, Seasons Express buses from Penang to Melaka and Seremban is direct bus without stopping in Kuala Lumpur. Update : Seasons Express has expanded their bus service network to Singapore by setting up a new office in Singapore Golden Mile Complex. Customer can now book Seasons Express bus from Singapore to Penang, Kuala Lumpur, Seremban, Ipoh, Simpang Taiping and Penang through BusOnlineTicket.com. Seasons Express deploys new fleet of coaches for this new market in order to gain the popularity in Singapore.